Google announced at its I/O conference in June 2014 that Android apps are coming to its Chrome OS. Earlier this month product managers Ken Mixter and Josh Woodward announced that the first four Android apps are available in the Chromebook app store: Duolingo, Evernote, Sight Words and Vine. I delayed posting about this until I found the time to investigate a little into how it works. I fired up an Acer C720 and installed Evernote from the Chrome web store (in addition to Evernote Web which was already installed). 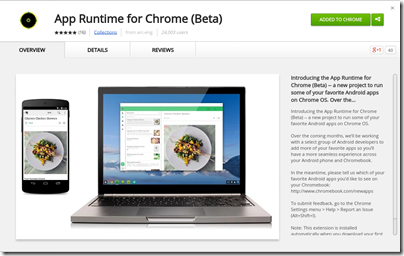 When you install your first Android app, Chrome installs the App Runtime for Chrome (Beta) (ARC) automatically. Incidentally, I found Evernote slightly odd on Chromebook since it is runs in a window although the app is designed to run full screen, as it would on a phone or tablet. This caught me out when I went to settings, which looks like a dialog, and closed it with the x at the top right of the window. Of course that closes the app entirely. If you want to navigate the app, you have to click the back arrow at top left of the window instead. But what is the App Runtime for Chrome? This seems to be an implementation of the Android runtime for NaCl (Native Client), which lets you run compiled C and C++ code in the browser. If you browse the parts of ARC which are open source, you can see how it implements the Android Open Source Project (AOSP) for arch-nacl: a virtual processor running as a browser extension. A small set of shared objects can be built which are part of ARC currently. A fully running system cannot currently be built. The desktop version is unstable, and apps that need Google Play services run into problems. Still, think of it as a proof of concept. In particular, note that this is Android Runtime for Chrome, not Android Runtime for Chrome OS. 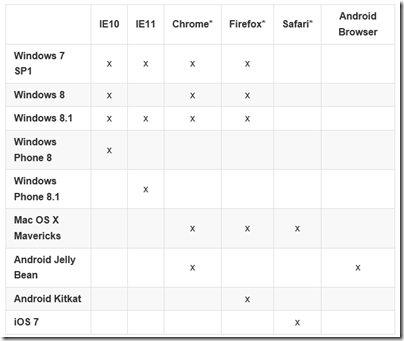 Google is targeting the browser, not the operating system. 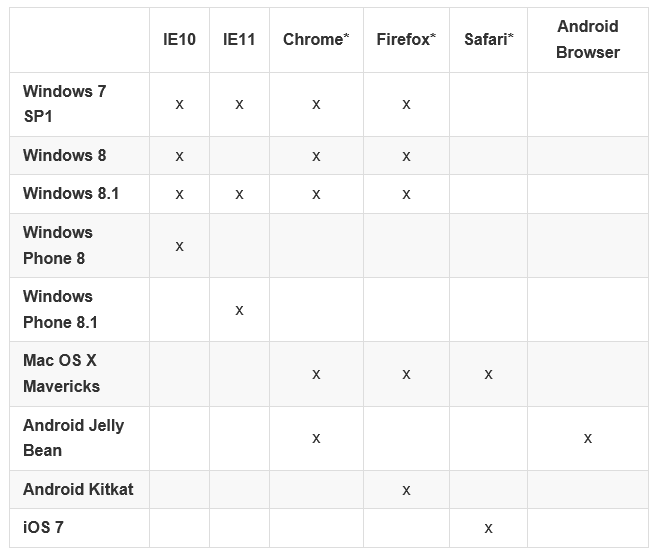 This means that ARC can, if Google chooses, become an Android runtime for every operating system where Chrome runs – with the exception, I imagine, of Chrome for iOS, which is really a wrapper for Apple’s web browser engine and cannot support NaCl, and Chrome for Android which does not need it. Imagine that Google gets ARC running well on Windows and Mac. What are the implications? The answer is that Android will become a cross-platform runtime, alongside others such as Flash (the engine in Adobe AIR) and Java. There has to be some performance penalty for apps written in Java for Android running in an Android VM in the browser; but NaCl runs native code and I would expect performance to be good enough. This would make Android an even more attractive target for developers, since apps will run on desktop computers as well as on Android itself. Might this get to the point where developers drop dedicated Windows or Mac versions of their apps, arguing that users can just run the Android version? An ARC app will be compromised not only in performance, but also in the way it integrates with the OS, so you would not expect this to happen with major apps. However, it could happen with some apps, since it greatly simplifies development. 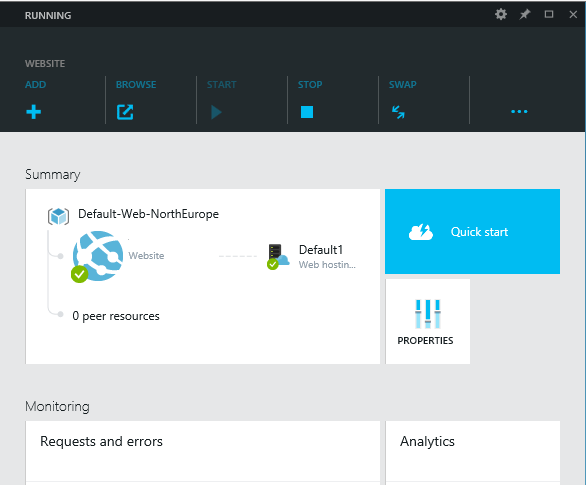 Microsoft Azure: new preview portal is “designed like an operating system” but is it better? 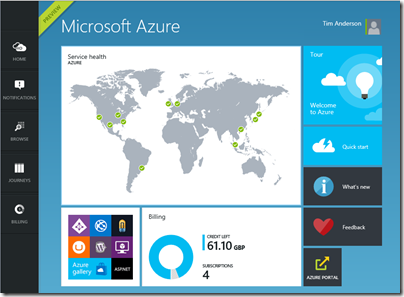 How important is the Azure portal, the web-based user interface for managing Microsoft’s cloud computing platform? You can argue that it is not all that important. Developers and users care more about the performance and reliability of the services themselves. 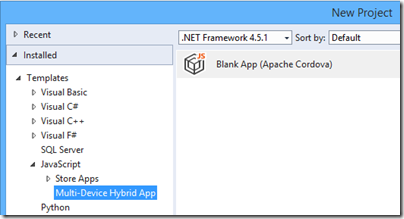 You can also control Azure services through PowerShell scripts. My view is the opposite though. 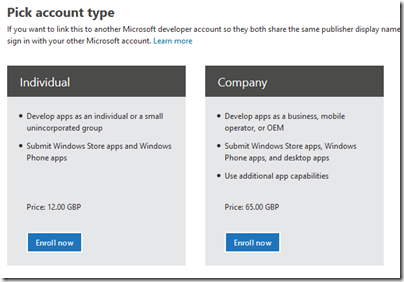 The portal is the entry point for Azure and a good experience makes developers more likely to continue. 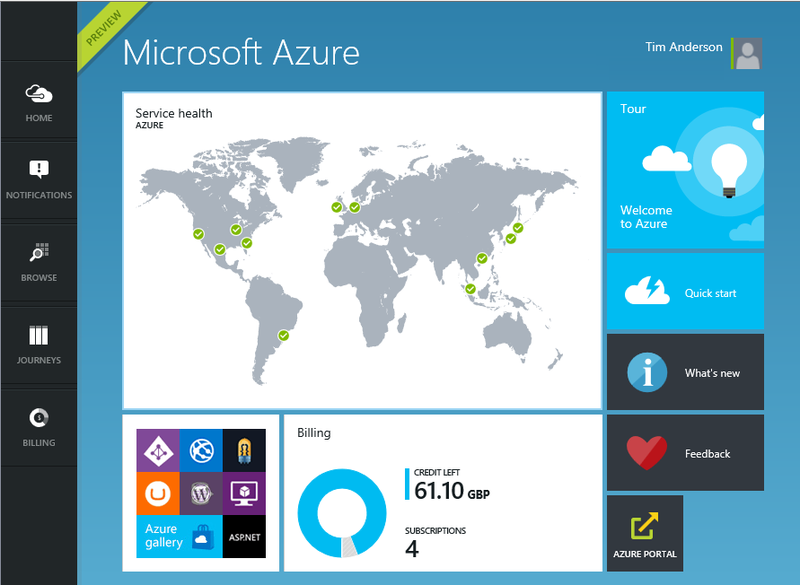 It is also a dashboard, with an overview of everything you have running (or not running) on Azure, the health of your services, and how much they are costing you. I also think of the portal as an index of resources. 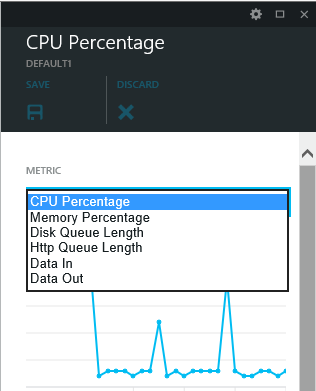 Can you do this on Azure? Browsing through the portal gives you a quick answer. 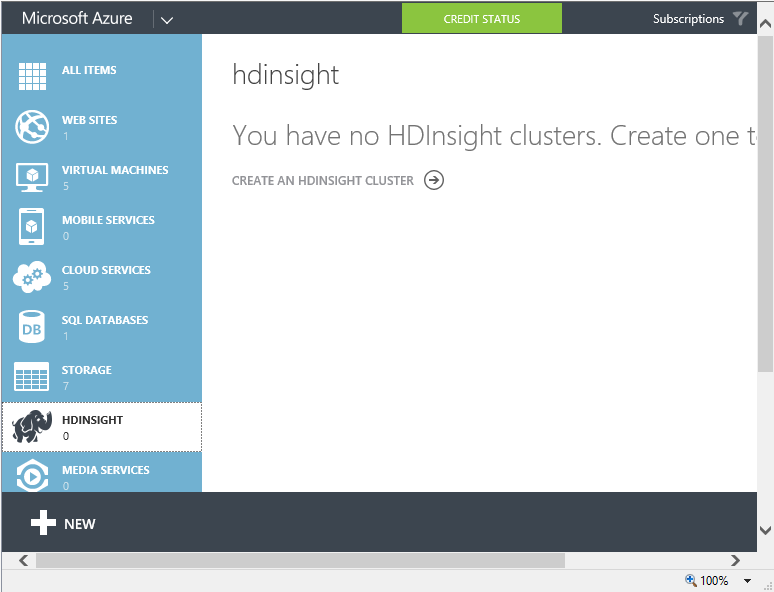 The original Azure portal was pretty bad. I wish I had more screenshots; this 2009 post comparing getting started on Google App Engine with Azure may bring back some memories. In 2011 there were some big management changes at Microsoft, and Scott Guthrie moved over to Azure along with various other executives. 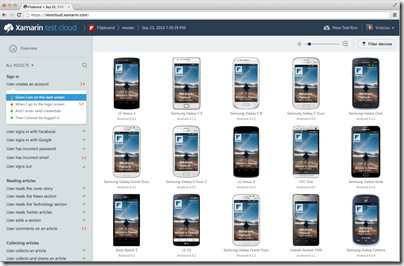 Usability and capability improved fast, and one of the notable changes was the appearance of a new portal. Written in HTML 5, it was excellent, showing all the service categories in a left-hand column. Select a category, and all your services in that category are listed. Select a service and you get a detailed dashboard. This portal has evolved somewhat since it was introduced, notably through the addition of many more services, but the design is essentially the same. It is an excellent portal, in other words, logically laid out, easy to use, and effective. That is the old portal though. 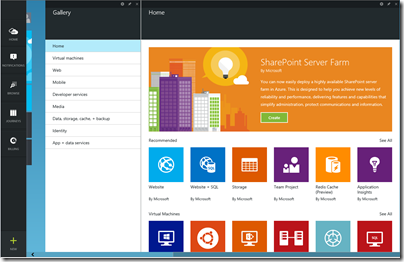 Microsoft has introduced a new portal, first demonstrated at the Build conference in April. 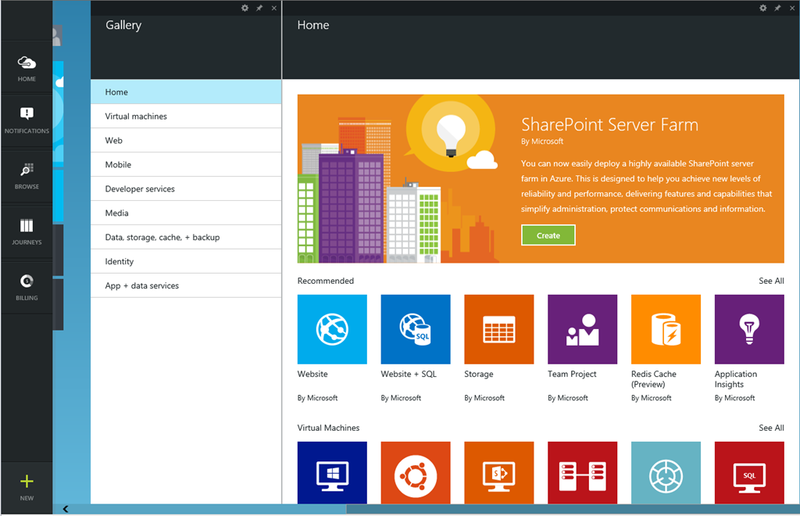 The new portal is at http://portal.azure.com, versus http://manage.windowsazure.com for the old one. 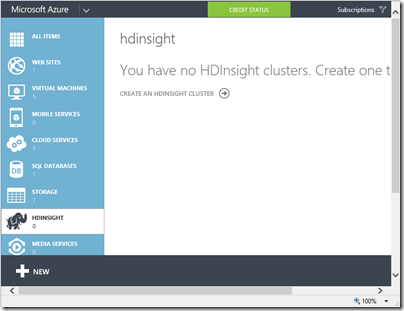 As we started ramping up the number of services in Azure, it became infeasible for one team to write all of the UI. The teams which owned the service were now responsible (mostly) for writing their own UI, inside of the portal source repository. This had the benefit of allowing individual teams to control their own destiny. However – it now mean that we had hundreds of developers all writing code in the same repository. 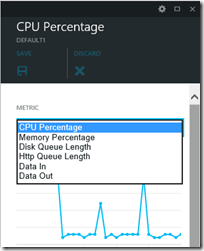 A change made to the SQL Server management experience could break the Azure Web Sites experience. A change to a CSS file by a developer working on virtual machines could break the experience in storage. Coordinating the 3 week ship schedule became really hard. The team was tracking dependencies across multiple organizations, the underlying REST APIs that powered the experiences, and the release cadence of ~40 teams across the company that were delivering cloud services. The new portal is the outcome of some deep thinking about the future. It is architected, according to Beckwith, more like an operating system than like a web application. The new portal is designed like an operating system. It provides a set of UI widgets, a navigation framework, data management APIs, and other various services one would expect to find with any UI framework. The portal team is responsible for building the operating system (or the shell, as we like to call it), and for the overall health of the portal. 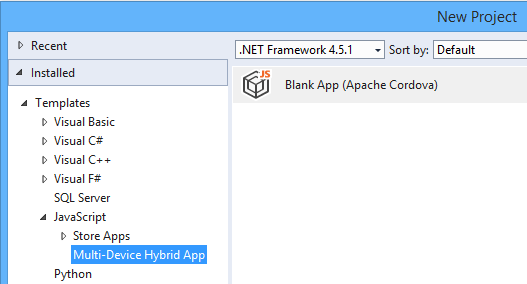 Each service has its own extension, or “application”, which runs in an iframe (inline frame) and is isolated from other extensions. Unusually, the iframes are not used to render content, but only to run scripts. These scripts communicate with the main frame using the window.postMessage API call – familiar territory for Windows developers, since messages also drive the Windows desktop operating system. Beckwith’s post is good reading, but the crunch question is this: how does the new portal compare to the old one? The icons are prettier, but there is something suspiciously like an ad at top right; I would rather see more services, with bigger text and smaller icons; the text conveys more information. Let’s look at scaling a website. In the old portal, you select a website, then click Scale in the top menu to get to a nice scaling screen where you can set up autoscaling, define the number of instances and so on. How do you find this in the new portal? You get this screen when you select a website (I have blanked out the name of the site). This screen scrolls vertically and if you scroll down you can find a small Scale panel. Click it and you get to the scaling panel, which has a nicely done UI though the way panels constantly appear and disappear is something you have to get used to. The preview portal also integrates with Visual Studio online for cloud-based devops. 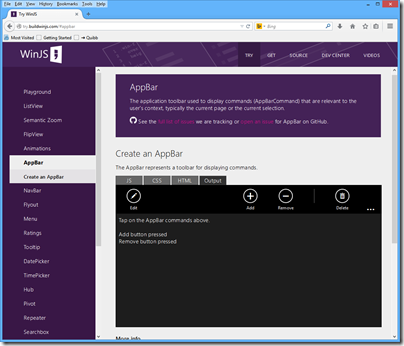 The challenge for Microsoft is that the old portal set a high bar for clarity and usability. 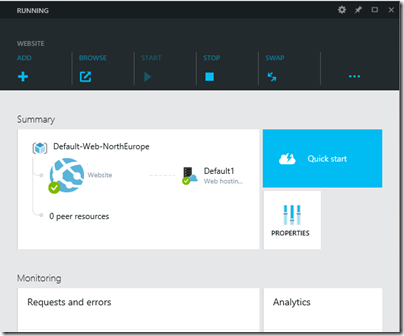 The preview portal does more than the old, and is more fit for purpose as the number and capability of Azure services increases, but its designers need to resist the temptation to let prettiness obstruct performance and efficiency. Developers can give feedback on the portal here. 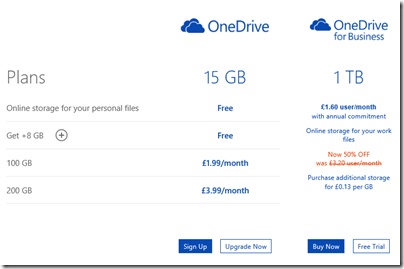 It is not that simple of course (and see below for how you can get 1TB OneDrive for less). The two products have different ancestries. OneDrive was once SkyDrive and before that Windows Live Folders and before that Windows Live Drive. 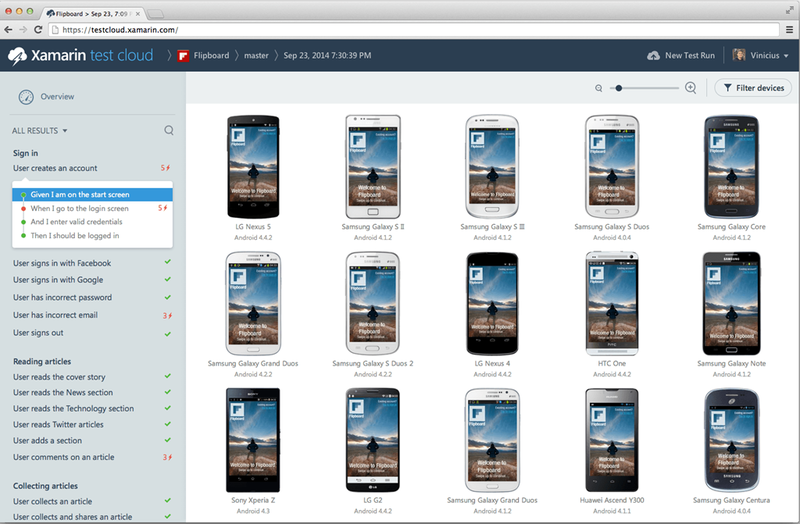 It was designed from the beginning as a cloud storage and client sync service. OneDrive for Business on the other hand is essentially SharePoint: team portal including online document storage and collaboration. The original design goal of SharePoint (a feature of Windows Server 2003) was to enable businesses to share Office documents with document history, comments, secure access and so on, and to provide a workplace for teams. See the history here. SharePoint supported a technology called WebDAV (Web Distributed Authoring and Versioning) to allow clients to access content programmatically, and this could be used in Windows to make online documents appear in Windows Explorer (the file utility), but there was no synchronization client. SharePoint was not intended for storage of arbitrary file types; the system allowed it, but full features only light up with Office documents. In other words, not shared storage so much as content management system. Documents are stored in Microsoft SQL Server database. SharePoint was bolted into Microsoft BPOS (Business Productivity Online Suite) which later became Office 365. In response to demand for document synchronization between client and cloud, Microsoft came up with SharePoint Workspace, based on Groove, a synchronization technology acquired along with Groove Networks in 2005. I have no idea how much original Groove code remains in the the OneDrive for Business client, nor the extent to which SharePoint Online really runs the same code as the SharePoint you get in Windows Server; but that is the history and explains a bit about why the products are as they are. The OneDrive for Business client for Windows is an application called Groove.exe. 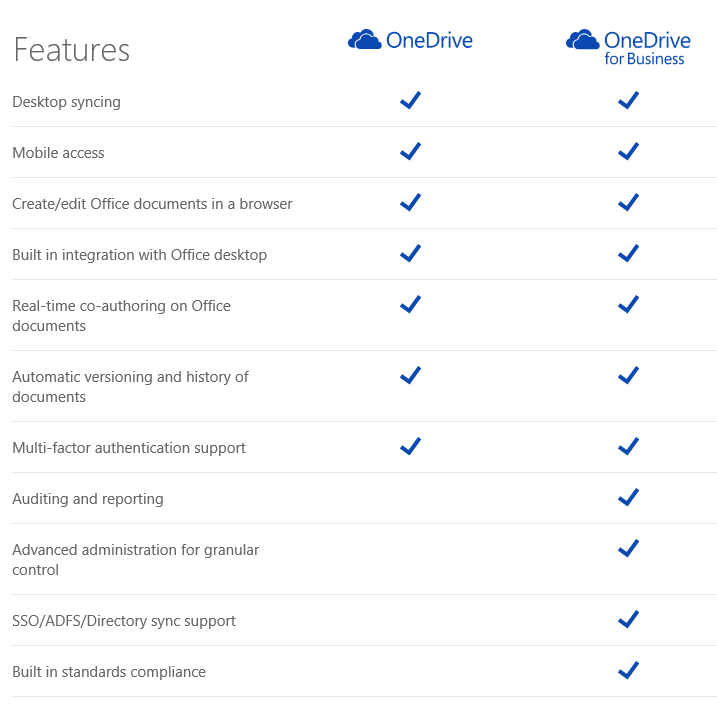 OneDrive and OneDrive for Business are different products, despite the misleading impression given by the name and the little feature table above. 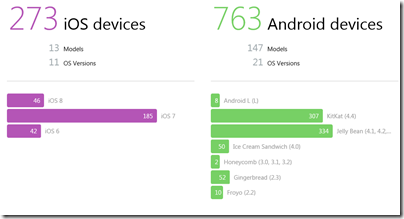 This is why the Windows, Mac and Mobile clients are all different and do different things. 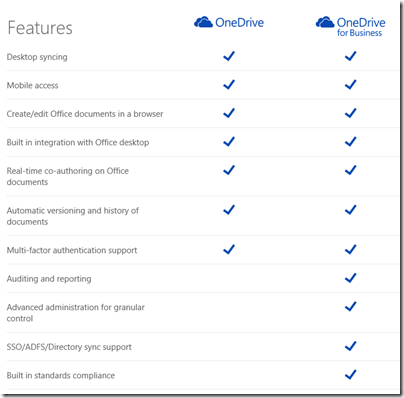 OneDrive for Business is reasonable as an online document collaboration tool, but the sync client has always been poor and I prefer not to use it (do not click that Sync button in Office 365). You may find that it syncs a large number of documents, then starts giving puzzling errors for which there is no obvious fix. Finally Microsoft will recommend that you zap your local cache and start again, with some uncertainty about whether you might have lost some work. Microsoft has been working hard to improve it but I do not know if it is yet reliable; personally I think there are intractable problems with Groove and it should be replaced. The mobile clients for OneDrive for Business are hopeless as DropBox replacements. The iOS client app is particularly odd: you can view files but not upload them. Photo sync, a feature highly valued by users, is not supported. However you can create new folders through the app – but not put anything in them. Office on iOS on the other hand is a lovely set of applications which use OneDrive for Business for online storage, which actually makes sense in this context. It can also be used with consumer OneDrive or SharePoint, once it is activated. The consumer version of OneDrive is mostly better than OneDrive for Business for online storage. It is less good for document collaboration and security (the original design goals of SharePoint) but more suitable for arbitrary file types and with a nice UI for things like picture sharing. The Windows and mobile clients are not perfect, but work well enough. The iOS OneDrive client supports automatic sync of photos and you can upload items as you would expect, subject to the design limitations of Apple’s operating system. Even for document collaboration, consumer OneDrive is not that bad. 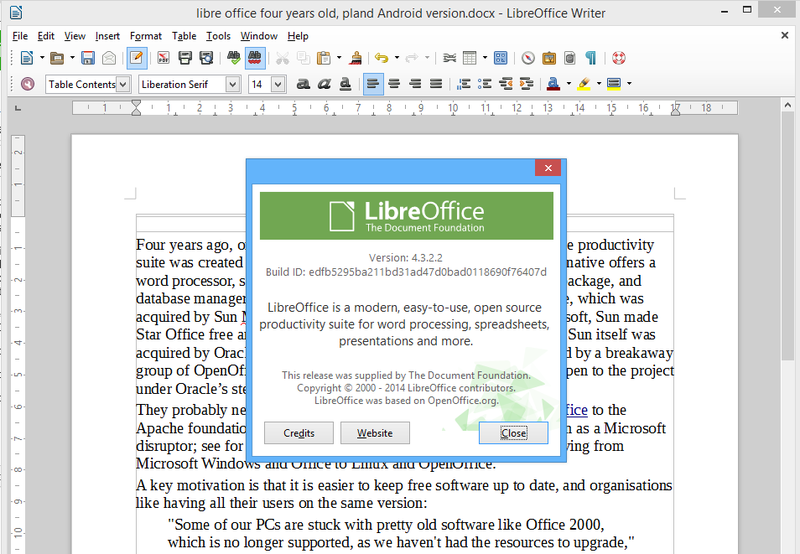 It supports Office Web Apps, for creating and editing documents in the browser, and you can share documents with others with various levels of permission. I do understand Microsoft’s problem. SharePoint has a huge and complex API, and Microsoft’s business users like the cloud-hosted versions of major server applications to work the same way as those that are on premise. However SharePoint will never be a optimal technology for generic cloud storage. If I were running Office 365, I think I would bring consumer OneDrive into Office 365 for general cloud storage, and I would retain SharePoint online for what it is good at, which is the portal, application platform, and document collaboration aspect. This would be similar to how many businesses use their Windows servers: simple file shares for most shared files, and SharePoint for documents where advanced collaboration features are needed. In the meantime, it is a mess, and with the explosive growth of Office 365, a tricky one to resolve without pain. Microsoft has a relatively frank FAQ here. 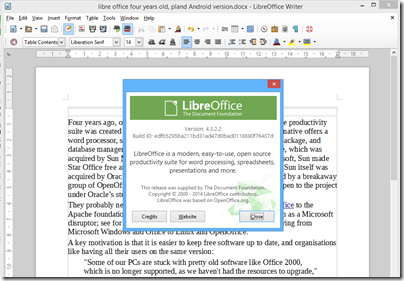 The way this works is that each user activates Office using a Microsoft account. The OneDrive storage linked to that account gets the 1TB extra storage while the subscription is active. Another option is Office 365 Personal – same deal but for one user at £5.99 per month, or £59.99 per year (£4.99 per month). 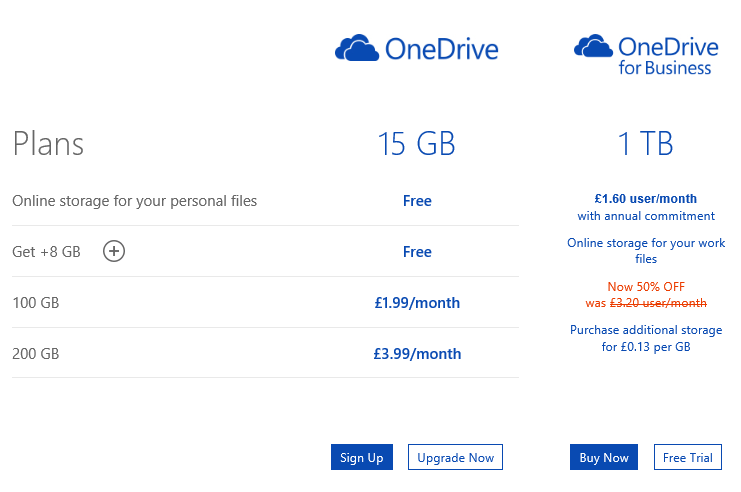 Even for one user, it is cheaper to subscribe to Office 365 Home or Personal than to buy 1TB storage at £3.99 per month per 200GB. When you add the benefit of Office applications, it is a great deal. Despite the name, these products have little to do with Office 365, Microsoft’s cloud-hosted Exchange, SharePoint and more. These are desktop applications plus consumer OneDrive. says Microsoft’s Todd Brix in a post today. He adds that the 600,000 developers already registered are covered, with no additional fee required. How much is the fee? Brix does not say, and I could not find it quickly, so I started the signup process. I was offered individual registration for just £12.00. A company registration is £65.00. Both fees are of course negligible for a developer, compared to the cost of developing an app that is worth installing. Considering that Microsoft has had problems with junk apps filling its store, you could argue that fees are justifiable as a means of restraining the flow of meaningless or malicious apps. The counter-argument is that fees deter developers from getting started, and that today’s hobbyist may come up with the next Minecraft. It is better to control quality with a robust checking process before apps are admitted into the store. I had a quick glance today, and have the impression that Microsoft has made progress in removing the worst offenders, following some agitation at the end of last month. Microsoft is laying the foundation for another go at its app platform with the launch of Windows 9, about which we will hear more in a couple of weeks time.